Nefesh B'Nefesh and SawYouAtSinai team up to produce a dating site to connect aliyah-minded singles. Imagine the frustration. Sitting, talking to your date, trying to connect, but every time the topic of living in Israel comes up they get a blank look on their face. You hope to make Aliyah one day, and they like the idea of visiting Israel, once in a while. What a waste of time. Determined to help singles avoid these types of aggravating situations, Nefesh B'Nefesh teamed up with the Jewish dating site SawYouAtSinai and launched ‘SeeYouInIsrael’, a new website exclusively for Aliyah-minded singles. “For many young people who are dating, the Israel question is a major issue that comes up,” reports Marc Rosenberg, Director of Pre-Aliyah Services at Nefesh B'Nefesh. With 14 other successful partnership sites to its name, SawYouAtSinai was the ideal candidate. 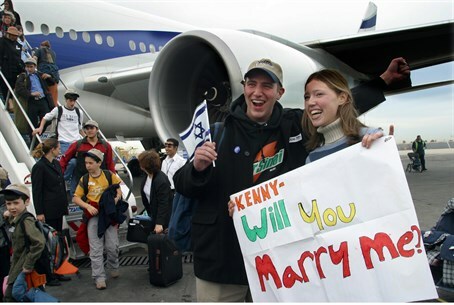 The custom-engineered matching technology and professional experience they have, assisting Jews living in other niche communities such as Australia and the Far East, University of Pennsylvania’s Hillel Gradnetwork, Yeshiva University students and alumni, and many others, is now available to Aliyah-oriented singles around the globe. Unlike typical online dating sites that leave singles fending for themselves, ‘SeeYouInIsrael’ is (brace yourself) manned by 45 real people who actually read your detailed profile, get to know you, and offer on-target suggestions. “Options are limited,” reflects Ian, an Internet Entrepreneur who lives in New Jersey. “What are you going to do? Walk up to a girl somewhere and ask 'Are you Jewish?' Having a website to do preliminary screening is definitely helpful. It takes away some of the hard work of narrowing down the pool. Since ‘SeeYouInIsrael’ launched this summer, over 1,000 people have joined. Many members already live in Israel but the majority are still living in the Diaspora, trying to move ahead with their plans to marry, and eventually move to Israel. ‘SeeYouInIsrael’ members run the gamut from those who prefer someone headed towards Israel to those who will only date future Olim. Ian is middle of the road on this issue. For Sarah, on the other hand, living in Israel is a deal breaker. Sarah, who works in the non-profit sector, moved to Israel just over a year ago and has told the matchmakers of ‘SeeYouInIsrael’ that she is only interested in men who are certain they are going to make Aliyah. Moshe, a born and bred Israeli who lives in Tel Aviv, is also a member of ‘SeeYouInIsrael’. Why would a native sabra look for his other half on an Aliyah dating site? Moshe doesn't take Israel for granted and knows that Olim don't either. “Finding the right person is more than a list of attributes to check off,” he admits. Yet it's clear that meeting women through ‘SeeYouInIsrael’ gets things off to a strong start.